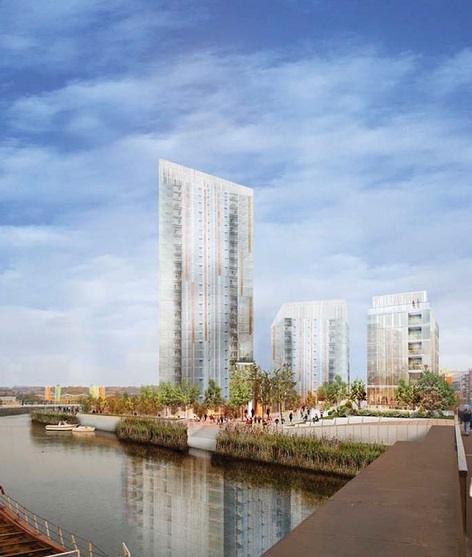 Thanks to Daryl at 853 for alerting me to a planning application before the Greenwich planning board tonight for 249 flats by the Creek in Deptford – an increase of 45 from earlier plans. I havn’t had time to read all the documents, so this post covers some select elements, and the Deptford Dame site has written a fantastic overview here. The 22-storey tower appears rather bulky and lacking much in the way of elegance. From some angles it appears pretty overwhelming. The developers are certainly trying to maximise massing of the tower with this one. The colour scheme will be interesting – I think this is one that will look better close-up, as the green sections appear to be glazed tiling. Here’s a quick round up of some details I noticed when browsing the plans. Firstly, the developer is Essential Living. Their developments comprise solely of private rented units, and should mean more flats are actually occupied than those which include a high number of private sale units. That often means many sold off-plan in Asia and unoccupied. As usual, the developers are claiming it’s in Greenwich when it’s actually in Deptford, and state they it will ‘create new destination for Greenwich’. No it wont. It also bizarrely seems to assume that as many people would board a train away from central London in the morning peak as heading to London Bridge and the City. As I noted in my last post, Deptford station has seen passenger numbers quadruple in the last 9 years to 1.2m a year. This is up 11.7% on the year in the most recent figures of 2013/14. And this development is just one of a number in the area. 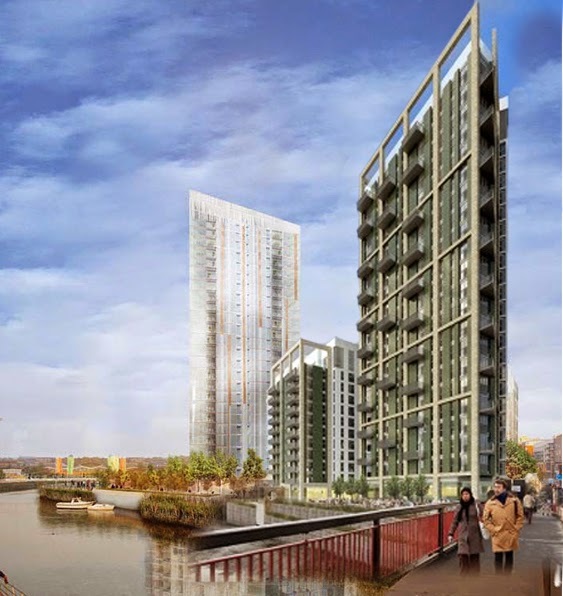 Next door is a planned tower in Lewisham borough (more on that below) and Kent Wharf, along with more lining the Creek. They also ask the GLA to assist them in pressuring the DfT. When it comes to the DLR, the entire Lewisham branch is seeing a huge amount of housing built alongside, and my post on Lewisham developments highlighted the numbers just there. There will come a time when serious upgrades will have to occur. It has exhausted the short term potential in terms of numbers of carriages when it went up to three a few years ago. Underground stations like Cutty Sark can only take two carriages as it is. Upgrading to four would require very expensive work. A possible Bakerloo extension to Lewisham would help but with typical UK lethargy, alongside transport and infrastructure investment aversion, means that the 1940s plan (!) is still at a very early stage with 2030 being mentioned as the earliest possible opening date. Is there any other developed city with such pressures that moves so slowly? 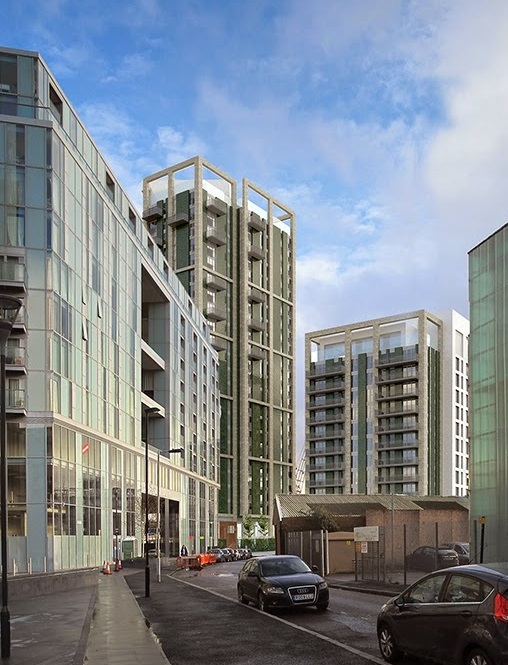 Whilst the plans on the Greenwich side do appear stumpy and inelegant, the Lewisham side proposal actually looks worse. The amusing renders try to make it almost transparent. That never happens. Look at the original stages of development in the render on the left, which line Creek Road. Hardly an accurate resemblance. Still, this opposition raises quite a few questions and it will be interesting to see if it has any real adverse effects on relations. If approved tonight, completion is due by 2017. Essential Living have secured substantial financial backing from investors recently, so if approved I expect work will proceed quickly. Are South East London’s railways up to coping with the new developments planned and already built, and is anyone taking a strategic view. Other good points in this blog which is worth a read. It seems strange that we are wasting more money on a new tunnel which will only increase pollution and car usage (= climate change) and yet basic rail infrastructure is creaking. Planning seems to be so piece meal – we are going to suffer for decades to come.